Religion comes from the Latin religio, meaning “to bind fast”. The Greek word in James 1 is Threiskos, which is a word meaning fearing or worshiping God, devout, observance of the Bible. Consider that there are at least four kinds of religion. Here they are. –>Paul who lived under that religion with a good conscience (Acts 23:1), as it was handed down all the way back with Moses, was no longer observing it. It was at one time “holy, righteous and good” (Romans 7:12), but it became obsolete (Heb 8:6-13). We should not observe even a legitimate, God ordained, religion if God has made it obsolete. indeed have an appearance of wisdom in self-imposed religion, false humility, and neglect of the body, but are of no value against the indulgence fo the flesh.” Col. 2:23. –> Here the word is a compound, ethelo-threiskia, same word as above for religion with additional thelo (that word from last weeks sermon, ‘I wish, I will, I desire’). So there is a religion that is rooted in human desire and wishes, instead of being rooted in God’s Word. –> When people today are turned off by “religion”, it may be that they don’t want what God offers. But it is also likely that the mega-church, conglomerate churches, and multiplicity of denominations that have roots in man’s wishes is turning them off. Worthless religion. James says, “26If anyone among you thinks he is religious, and does not bridle his tongue but deceives his own heart, this one’s religion is useless. Here, James is addressing the individual Christian who isn’t living what he claims to believe. James says it is worthless. True religion. But there is a TRUE RELIGION in the Bible. What Christ lived WAS TRUE RELIGION. What disciples of Christ lived and preached WAS TRUE RELIGION and it should not ever be disregarded. –> 27Pure and undefiled religion before God and the Father is this: to visit orphans and widows in their trouble, and to keep oneself unspotted from the world.” James 1. –> Therefore when someone makes the blanket statement, “I don’t want anything to do with religion. Christianity is about a relationship”, they have been duped into SPEAKING AGAINST TRUE RELIGION. 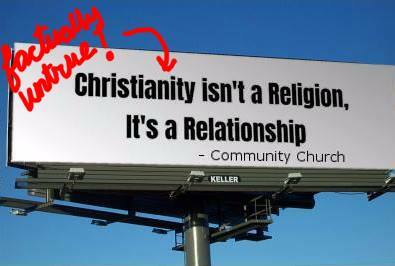 –> A statement like “Christianity isn’t religion; it’s a relationship” IS FACTUALLY UNTRUE! To hear James 1:27 say “pure and undefiled religion before God” and then to say Christianity isn’t a religion is to speak against the Bible. What else is “pure and undefiled” but what is from God! We want and need to speak where the Bible speaks and this means we are careful not to mimic the catchphrases of modern “religious” speak. They don’t know it, but they have become part of false religion. Instead of falling for cliches that are factually untrue, don’t budge, and instead teach the truth. If we don’t follow the Word of God, then even our worship to God is defiled and is displeasing to God. Jesus said, “3Why do you transgress the commandment of God because of your tradition….7Hypocrites! Well did Isaiah prophesy about you, saying: 8These peole draw near to Me with their mouth, and honor Me with their lips, but their heart is far from Me. 9And in vain they worship Me, teaching as doctrines the commandmetnts of men.” Mt 15:7-9. Some are going to rebel and speak against what God has given to us. See 2 Peter 3:3. –> When people are against God’s true religion, it is symptomatic of the rebellious society that is repelled against all authority. But people of faith know that there is a beginning place for righting your life. Look at Job 28:28. Where is wisdom and understanding to be found? How about if instead of abandoning Biblical words that we teach people the truth so that they see the wisdom of turning from all human religions to align their lives with True Religion from Jesus! –> Isn’t this exactly what people say they are looking for when they say they want a relationship? See, when we follow Jesus Christ, and pattern our lives after Him, that’s understanding and knowledge that is the basis for a real relationship with God.